British studio Weston Williamson has unveiled a trio of Hong Kong skyscrapers that "kiss" one another, designed to sit on top of a new high-speed railway line. 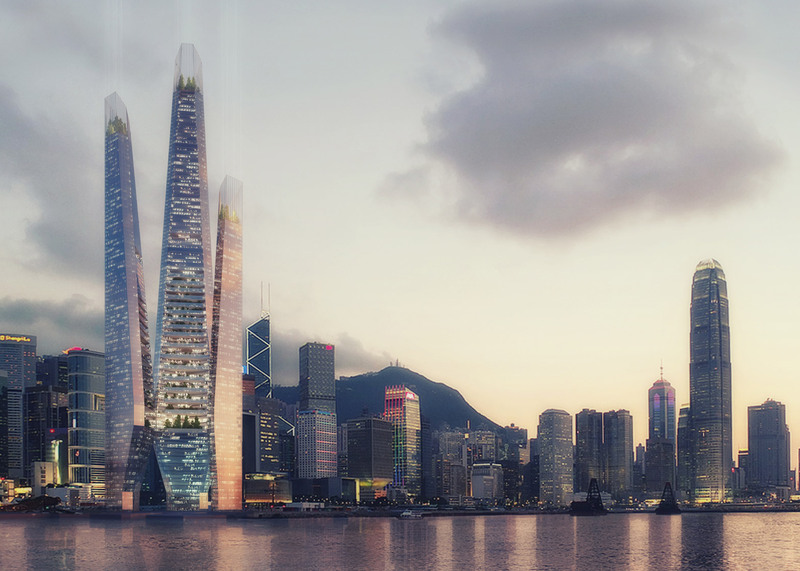 Proposed for Victoria Harbour, the high-rise complex is envisioned as a cluster of towers with heights of up to 440 metres, all arranged around a landscaped plaza. The three towers are to feature tapered profiles, which will allow them to touch between the 21st and 25th floors. It is this connection that Weston Williamson describes as the kiss. "The towers momentarily kiss, creating the main public spaces within the building," explained the architecture firm, whose previous designs include a shape-shifting stadium. "Beyond this point, each tower recedes to leave three iconic diminishing towers sitting harmoniously in the Hong Kong skyline." The project is named Arcology Skyscraper – using a term that combines the words architecture and ecology. It is one of a series of designs by Weston Williamson intended to emphasise the importance of transport-focused architecture. The complex will encompass housing, offices and retail. It will be located directly above a high-speed rail line – a proposed extension of the new Guangzhou–Shenzhen–Hong Kong Express Rail Link, the new 88-mile-long route connecting Hong Kong to mainland China. "The Archology Tower would not be feasible without the high-speed rail link underneath the new towers," said Weston Williamson. The positions of the towers will help to divide the complex into three zones, creating a total floorspace of 250,000 square metres. Commercial areas will occupy the lower storeys, while residential will be located on the upper levels. "The form of the building is designed to generate the maximum high quality floor space whilst responding to the unique intricacies of the central Hong Kong site," said the architecture firm. "At ground level, the three towers form a large central square orientated to Victoria Harbour and an extensive park enhances to the wider urban realm, creating much needed green space along the central waterfront. As the building rises, each floorplate expands incrementally to provide deeper space allowing for greater flexibility in use." Founded in 1985 by Andrew Weston and Chris Williamson, Weston Williamson has offices in London and Kuala Lumpur. The practice has worked on a number of London infrastructure projects including the Jubilee Line station at London Bridge and the upgrade of Victoria Station. It is currently working on the new Crossrail station at Paddington. Victoria Harbour is also the location of the Herzog & de Meuron-designed M+, a new museum of visual culture scheduled to open in 2018. It forms part of the West Kowloon Cultural District, which will eventually comprise 17 cultural venues around a 14-hectare park.